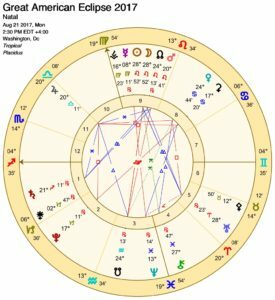 Great American Eclipse 2017 Astrology: it’s not over yet! The eclipse that occurs August 21 2017 is part of a Saros Cycle – an eclipse that occurs every 18 years, 11 days, 8 hours – in roughly the same sign and same degree. A Saros eclipse moves over time from one Pole to the other and lasts 12-13 centuries. The Great American Eclipse 2017 is actually the 22nd eclipse in its particular Saros Cycle which began in 1639. It is worth noting that in 1639, colonization of North America by Europeans was only 3 decades new. Saros eclipses begin at partial and grow to total over time – the first total for this eclipse series was in 1927 when Stalin was installed in the Soviet Union and carving began at Mount Rushmore. Why do I think these two seemingly disparate occurrences are relevant to this eclipse? Very hard lines were drawn in the Eastern Block as to what behavior was acceptable to the Communist ideal. At the same time, the USA overlooked a treaty for the Black Hills to keep Lakota sacred site in perpetuity. Mount Rushmore is carved in the Black Hills. From Earth’s perspective, eclipses upset the natural order. Yet eclipses are trackable — even long before telescopes. Eclipses occur at least 4 times a year. We don’t always realize this because they may not be seen where we live. Eclipses remind us that chaos is part of the natural order. Eclipses reveal and provide a flash of insight; how personal this is for you depends on if the degree of the eclipse (in the case of the Great American Eclipse 28°Leo 53″). Where does it fall in your personal horoscope and does it “hit” any planets or points? Eclipses reveal over time more and more of what triggered at the time of light. When the Moon (representative of the Soul’s journey) and the Sun (symbolic of self-expression) are merged from Earth’s perspective, we are poised for a leap of evolutionary consciousness, should we take it. This does not come without resistance to change. Do not think it all ends after 2:30 PM ET when the eclipse is exact. This continues to have resonance for a few days (as it has before). Then the sensitivity of the trigger points unfold in the months to come. For example, in July 1945 when the eclipse occurred it set up the energy that would unfold in August when Hiroshima and Nagasaki were devastated. 18 years and change in July 1963, that eclipse precipitated the NAACP sit-ins and MLK’s “I have a dream” speech. In the fall, four girls were killed at the Baptist church bombing and Kennedy was assassinated. In 1981, this same eclipse occurred just after the Royal Wedding of Diana and Charles brought millions of people together as they watched it on television. It also happened just before Reagonomics pushed through Kemp-Roth which radically changed the tax structure that had taxed the wealthy. In 1999 Putin became the Prime Minister of Russia at the time of the August eclipse. This particular eclipse cycle seems to occur during pivotal events. These eclipses do not follow the same exact path, so never before has the eclipse cut from OR to SC. To a symbolist like myself, this happens at this time for a reason. As we consider the emotional climate of the USA at this time, even someone who doesn’t spend their life analyzing symbols can be struck by this. Eclipses come in pairs; a solar eclipse ALWAYS has a lunar eclipse either before or after. In this case, the Lunar Eclipse occurred on August 7, 2017 at 15° Aquarius 24″. No one in the USA saw it because it happened in daytime. But the symbolic effect of an eclipse happens whether you see it or not. 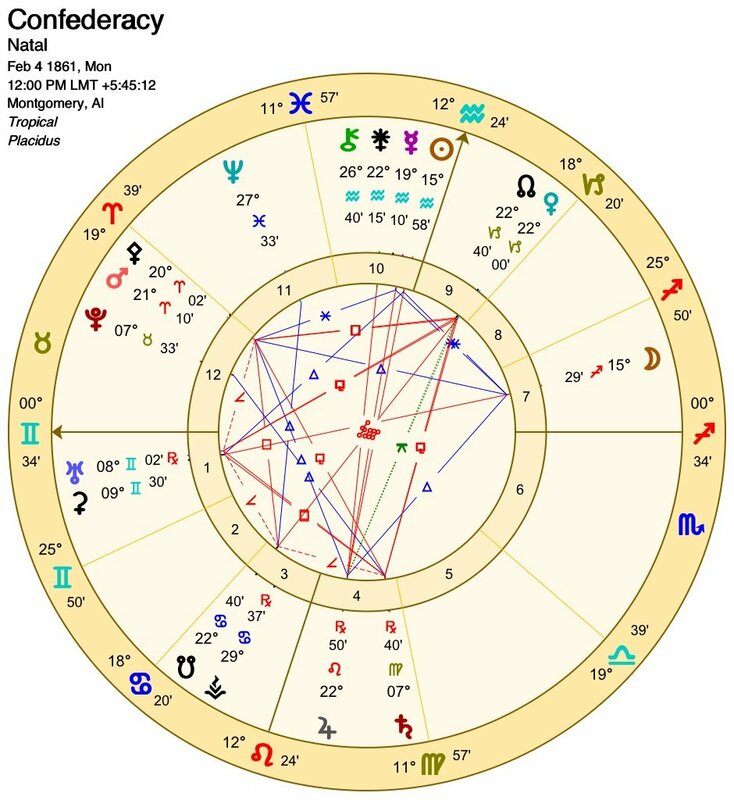 Since many astrologers love to troll history (because our research helps us understand where we are and where we are going), I have studied the horoscope of the Confederacy. This intrigues me because the Confederacy was never formally abolished. General Lee surrendered of course and Reconstruction began, but a formal dissolution to the agreement of the Confederacy never happened. Anyone who has owned a business or entered a marriage knows that the formal declaration of its ending is a completion. When a business, marriage or government contract is formed it creates an energetic entity. I have written about the need for the US to make atonement and formal resolution for its two great grievances to its people. One is to the First Nations and the other is to slavery. We still have to do this. Either that, or we continue with our fractured nation, which is not a course for growth and renewal. The August 7, 2017 Lunar Eclipse occurred EXACTLY on the Sun of the Confederacy chart. The Full Moon offers opportunity for integration. The USA needs to initiate conversations to integrate the needs of all its people; it can’t simply legislate or police them. Unfortunately, there are leaders who see that their power is totally dependent on the divide and conquer frame of rulership. A people divided can never be defeated. Listen to the words of leaders and see who works to unite. It makes perfect sense from a symbolic context, that people who felt the purpose of the Confederacy was short-changed would be emboldened to express their passions during this eclipse season. The Confederacy horoscope has a North Node/ Venus conjunction in Capricorn. Pluto has traveled in Capricorn since 2008. Pluto symbolizes irrevocable transformation; life will never be the same. Pluto reaches the degree of this conjunction before it makes its return to its degree on the USA horoscope. A Pluto return indicates a phoenix experience for a country or business. Since the Aquarius Moon of the USA horoscope is close to degree of the Confederacy Chiron, this is a wound that may never heal. Yet it is possible to prevent repetition by recognizing the poison. The answers here are through dialogue. We will witness more clashes as the summer unfolds into autumn and beyond. A forum for unity can’t be created until there is a deep understanding of the depth of the Shadow. The Great American Eclipse 2017 occurs exactly on the Rising Sign/Ascendant of President Donald Trump. The Ascendant is the persona — how he appears to the world. 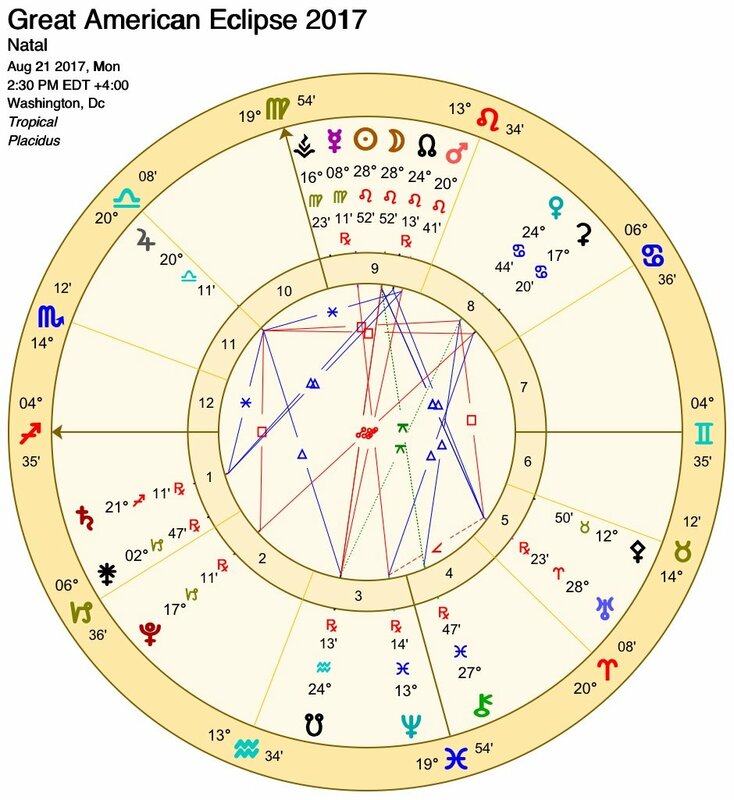 Trump was born with Mars rising (hence his assertive/aggressive stance) with the fixed star Regulus. Regulus is the heart of the lion and people with strong aspects to it enjoy a royal treatment. There is one caveat; the eventual downfall of Regulus natives occurs if they practice revenge. We shall see what the eclipse reveals now and over time. If you have questions about where the eclipse falls in your horoscope, post your birth information, date, place and time and I will respond as I can. Hey there Dawn! The eclipse lights up your 7th house of partnerships, so whether business, clients or romantic — the activity should increase. Take note to who contacts you or comes to your attention over the next couple of days. Thanks so much Pamela! I was born in the Bronx on 9/19/55 at 6:35 AM. Hi Pamela…your column brings me peace and understanding. Thank you. I’m an identical twin born 12-31-1966 in Bad Kreuznach, Germany (US Army base) at 2:04pm. We we delivered a month early via c-section. I have felt the Pluto transit keenly, in both light and dark ways. What can you tell me about the eclipse’s impact on my sign? Thank you for sharing your birth information, Beth. This eclipse occurred almost exactly on the point of the Moon in Leo when you were born; it lit up the area of life that ignites creativity, passion, risks and play. The Pluto transit suggests possibility of obsessions, which can be a love affair without resolution or an intense creative exploration. Because your natal Moon trines Mercury and you mention a twin, revelations or information from the past may come up over the next few months. Keep in mind that the eclipse was a New Moon and we are presently in a time of ripening intentions. Writing/journaling can help you find your way in the dark. Thanks so much for this Pamela. I’d love to know for myself. Thanks for sharing, Alysa. This eclipse lit up the house of routine, health and work…. which may need an adjustment over the next couple of months. A yen to travel or expand your horizons can translate to an actual trip…. ….or what in your day-to-day life needs a more personalized template? You should be reaping the benefits of hard-won success right now, which sometimes means a modification in the way you’ve done things up until this point in time. Not everyone in your life may be with the new program, but if it’s true to you, then forge ahead. Once you start to ease into something new, you’re going to make it your own. The hardest part is the turn off the well-worn path. Since I don’t know your exact time of birth, I’m concentrating on what is sure. You may feel a great push to assert your individuality at this time, especially in relationship. This can be a romantic, business partner or client. The past couple of years have probably brought profound change your way and the eclipse season offers an opportunity to have different conversations. Use this New Moon energy to craft clear intentions, especially any that magnify your voice. Next month’s New Moon on 9/20 can really launch new beginnings for you — it starts through definition and crystallized thought. I am very interested in my horescope as I have learned I am part Native American. I was adoped and just found my birth mother age 90. My father, who was Native American from the Blackfeet nation, is deceased. What an exciting time for you… and what a great gift for you to give your birth mother at her advanced age. These discoveries are profound for the psyche. Not everyone is motivated to do such a search, but this revelation dovetails with this eclipse season. 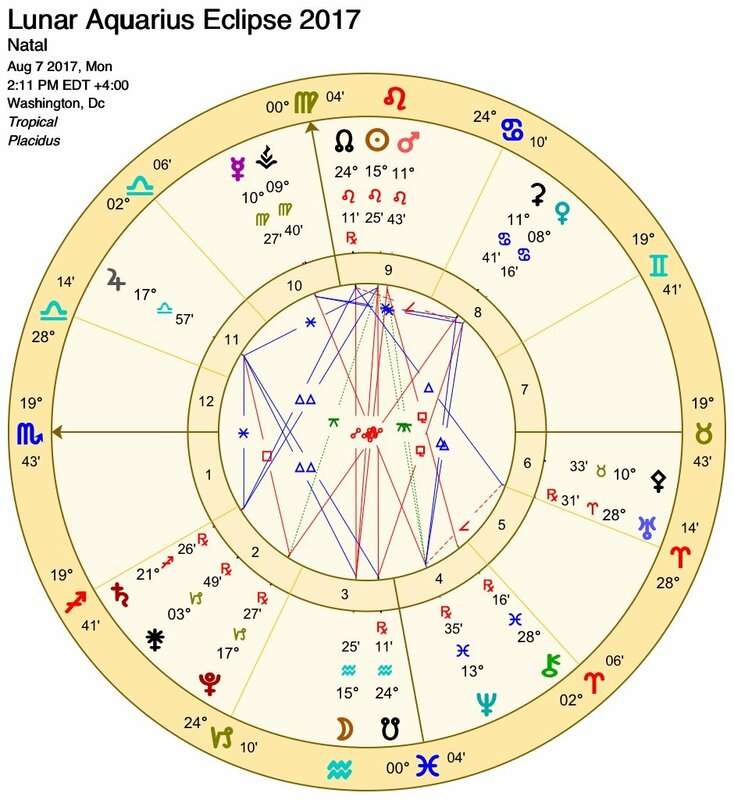 Your North Node (destiny point), Ascendant and Moon are all in Leo and the August 7 Lunar Eclipse triggered those points. Jupiter is rising as well, so this gives you a depth of self-awareness that must feel like coming home. It’s not so much about who your birth parents were (although that certainly is gold to mine) but everything that falls into place with that knowing. You are Leo Rising and with the August 21 Solar Eclipse igniting your first house, you might feel the impulse to share your story with everyone you meet. It’s a journey that takes courage and a loving heart. This story can help, heal and change systems. It deserves to be heard. I know this eclipse is in my sign and that it’s supposed to have a pretty big impact, but I’m not quite sure what that even means…? The eclipse’s degrees trigger the area of life in your horoscope about travel, higher education, foreign lands, publishing, philosophy and legal matters. 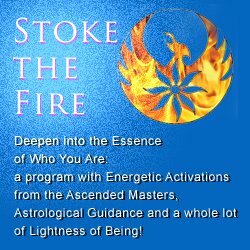 Since your Sun and the planet Saturn were in that house at your birth, this suggests that something will be revealed to stimulate activity in one or more of those themes. This is New Moon energy, so what do you want to make happen with intention? You’ve got a bit of a turbo-boost. I’d say fasten your seat belt – looks like horizons widen. Thanks for your question… wow! You’ve been feeling that “rock and a hard place” for awhile and then “kaboom!” something just gives. This should ease up in the coming months and end of year puts you in a much different place. The eclipse lights up your personal finances – where the money comes from and what you do with it. Accountability is key and a close look at everything, with the how and why of money. The eclipse was a New Moon of course and this is the perfect time to set your money intentions! Thanks for your request. Messages abound for you with this eclipse – so much buzz increases the need for self-care. Eat grounding foods that nurture. Find a time and place to rest and meditate daily. Memories from the past may surface, especially connected to home and roots. This can be an excellent time to journal/write without censor. Be aware of signs, symbols and inspiration. Jot them down for greater insight in the weeks to come. The eclipse has poised you to be out front and center, which is not unfamiliar to you. However you have been through some major shifts and continue to process, so you may not always appreciate the light shined on you. It’s OK to be yourself, even though it now feels like a work in progress. Grounding techniques like meditation, yoga and/or martial arts can be terrific at this time. It’s not always easy to be a catalyst, so keep an open dialogue with at least one trusted person. I so enjoyed reading your post regarding the eclipse! If you have the time, I am very interested in learning how the eclipse falls in my horoscope. Thank you for your feedback. The eclipse falls in your house of intimate relationship: business, romantic, therapeutic and clients. There can be sudden shifts or revelations with the people in your life. Comings and goings that impact your routine may seem abrupt at first but make way for more consistent alignment with your values. This is an excellent time for you to focus a clear intention on what you’d like to happen — go for the ultimate hope and wish! Don’t worry about the how (tough for a Capricorn with a Virgo Moon to hear) but envision the desired goal. Thank you in advance, Pam. Thank you for your note. The eclipse occurs in your house of intimate relationship: business, romantic, therapeutic and clients. Because certain situations are not in your control, this is a time when you simply respond to what’s presented to you. Changes with people in your life, especially women, have an effect on what you feel able to do. Opportunities are coming. Your job is not to push an agenda at this time but to facilitate what’s needed. Just because it wasn’t part of your original plan, doesn’t mean it isn’t part of your divine design. Hello and Thank you Pamela! 6/15/1955 2:44 AM, Concord MA. Thank you for your request. The eclipse lights up the area of life that is about creativity, romance and play…. wow! It can lead to a revelation and/or inspiration. It also can indicate news to do with children, if you have any. A review or different perspective of a love affair is also possible. The ideal is to let yourself enjoy life with childlike presence when you can. Wow is right! Thank you!! Have missed our monthly visits! Hope you are well! Thanks so much for this intriguing information!! I am 3/18/54 at 10:25pm. Thank you for sharing, Nisha! It’s good for people to have perspective in this tumultuous time. History is one of our teachers. The eclipse’s degrees trigger the area of life in your horoscope about travel, higher education, foreign lands, publishing, philosophy and legal matters. Since you are Sagittarius Rising, this should provide you with a lift, but the road has been quite uphill for awhile. It looks to me like a big shift occurred for you about 2 years ago which wasn’t all easy. As you approach the end of this year you can really sink into new alliances and goals with greater support and flow. Hi Pamela! I always enjoy your insights! Karen – no worries about late to the eclipse party… it’s the gift that keeps giving – although I must admit, the revelations aren’t always easy. Very transitional time for you (I know, you’re thinking – not that again!) But seriously, the eclipse has triggered the area that has to do with money and possessions you share with others, as well as legacy and inheritance. Some kind of move is upon you. Keep the light shining in the direction of unearthing information that needs to be seen and explained. The more direct you are, the more efficient the process. The timing to do this is absolutely right. Good luck! WOW! this was a REALLY interesting take on the state of our world, the confederacy….it resonated with me….thanks for these insights….Truly helpful! Thank you for your feedback, Whitney.